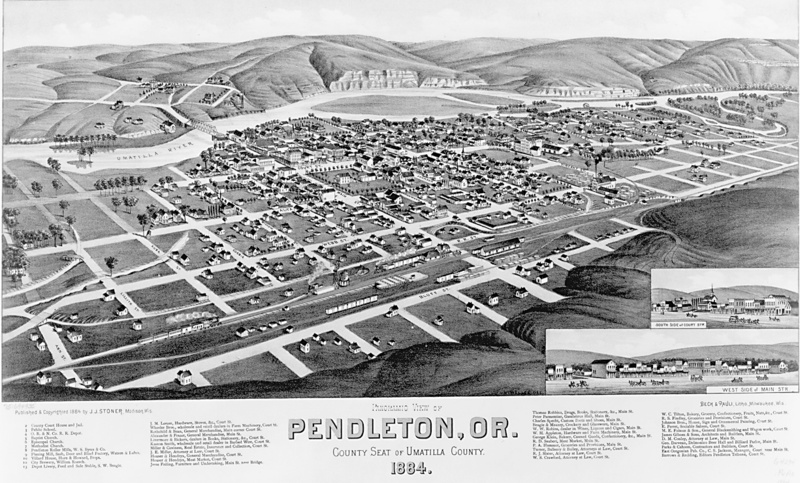 Pendleton, Oregon was founded in 1868 in the Umatilla County just off the Umatilla River. The Umatilla County was created on Sept. 27, 1862, from a piece of the Wasco County. Umatilla is an Indian term meaning “rippling water” or “water rippling over sand” that gave the name to the country and their major river. A town with the population of 16,612 people Pendleton, Oregon is known for their famous Pendleton Round-Up that is one of the largest rodeos in the world and their Pendleton Woolen Mills where they export blankets and clothing all around the world. 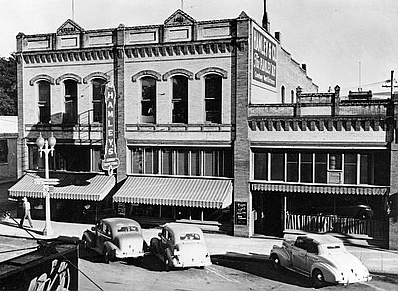 The city has historically brought many opportunities to Eastern Oregon through their cultured activities, events, moving pictures and theaters. Hamley Co, store (date unknown). Pendleton Woolen Mills (date unknown). The city of Pendleton has a relatively rich history, and when acknowledging its politics, society, and demographics, in regards to its relevance with exhibition, there are some seemingly interesting occurrences that lead to a greater understanding of the town’s exhibition tendencies. When referencing demographics, there are a factors that point to a conclusion. For one, the early 1900’s, about forty years after its founding, the town had begun making more residential housing areas to expand itself and enlarge its population. Pendleton succeeded in this with the Buyers Park and Coles additions creating a demographic that no longer included only workers and lumbermen, but simple residents which plays a large part in the numbers of entertainment consumers throughout the area. Politically, there were a couple of key players, but in this regard one of the most relevant is Roy Raley. Mr. Raley had become the president of a big event in Pendleton called the Round-Up which attracted many visitors and was overall a great source of entertainment. Raley was an avid promoter of entertainment as a whole, especially in his town of Pendleton, and could be considered a servant of entertainment seeing as a few instances of regulation of the round up and entertainment as a whole were thwarted by him as he showed great loyalty and perseverance. In 1909, another significant group was formed that could have been relevant to exhibition. It was the Pendleton City and County Medical Society. This was formed so that doctors and others in the medical field could discuss progressive medicine and surgical techniques. The relevance to this however comes in a more societal manner. Exhibiters had to promote to children heavily to gain the appeal to the families, and if a child was sick, then the family would not go out, obviously. However when searching through advertisements, there were several medical ads that were backed by this society placed rights next to or after performance ads. One example is Mother Gray’s Sweet Powder For Children, which evidently cured just about everything from colds to teething disorders. Another excellent example is Deans Kidney Pills. These were pills that essentially alleviated back pains and spasms, which was significant in Pendleton seeing as it was a lumber town and the lumbermen surly had back pains from their long days on the mill. Pendleton Oregon’s art and culture realm is filled with a variety of interest and community building centered around the small town in Umatilla County. Pendleton provides an array of Museums, farmer’s market and underground tours of historical Pendleton along with their famous Pendleton Round up and historic Pendleton Woolen Mills. In the years of 1922-1930 Pendleton was bustling with people. Many had jobs at the Woolen Mills or when it was time for the Round-Up many were able to receive jobs from it. With the wave of people coming into the town every September, it brought many actors, actresses and film makers to see what it was all about. Pendleton, Oregon would show up in newspaper articles from across the state and California talking about what actors were visiting and the films being made in Pendleton about the Round-up. This lead to the first theater opening up in 1906 named the Pastime Theater. From then on Pendleton popped up more and more theaters to cater to their towns people and visitors demands for more. In a town filled with rich history, Pendleton has continued to expand their art & culture and has many museums to explore. From children exhibits, heritage museums to art it has a strong backbone of community involvement with various membership and council positions for Oregonians to participate in. The Pendleton Center for the Arts is one of Pendleton’s most popular community attractions for tourists and locals. The center is located in the historic 1916 Carnegie Library building on the banks of the Umatilla River in downtown Pendleton, Oregon. They have classes for adults and children, have live music performances and special art events/exhibitions. It had been the center of the Pendleton Community since it first was established. The Culture of the town can be seen through Pendleton’s underground tours. The tour visits the Empire Building (1907), The Hendricks Building (1897) and the Empire Meat Company (1895). There guests can see original sidewalks and basalt-rock tunnels painted in their original state. Visitors of Pendleton have the ability to stay in some of these original buildings. 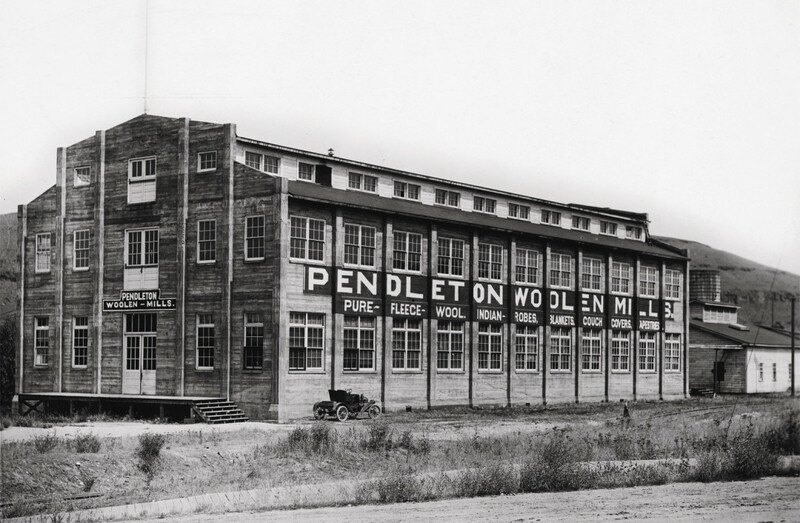 Famous for their woven Native American-inspired design blankets and textile clothing is the Pendleton Woolen Mills. Founded in 1863 by Thomas Kay and continued by his three songs right here in Pendleton Oregon in 1909. The company stays local through its operations but expands nation wide with its business and sales. Tours are available to see the process of the making of them and learning about the heritage of the company that has been pasted down through generations. Pendleton Center for the Arts History, pendletonarts.org/index_files/About_us.htm. “Pendleton Heritage.” Our Planet | Pendleton, www.pendleton-usa.com/pendleton-heritage.html. “THE HISTORY OF THE PENDLETON UNDERGROUND TOURS.” World Famous Pendleton Underground Tours, pendletonundergroundtours.org/. When one thinks of a historic key event in Pendleton, the first thing that may come to mind is the Pendleton Round-Up which had its start in 1909 following a 4th of July celebration. The round up was officially made into a non-profit event the following year in 1910, bringing in numbers going in to the 7000’s. What most may not know is that one of the original creators of the Pendleton Round-Up, Sheriff Tillman, known by most as just “Til” was shot and killed in a jail break in 1920. There is a park still available for tourists and the rest of the Pendleton population that is named after him. Another key event that happened right before the start of the Rodeo was the creation of the East Oregonian Newspaper which launched as a company in Pendleton in 1908. Although the paper had been creating copies since the late 1870’s it became a full run company with numerous employs and a profitably business in 1908. The Burke Act of May in 1906 allowed the government to issue fee patents and basically sell the land of the Confederated Tribes of the Umatilla Indian Reservation (CTUIR). This although not ideal for the CTUIR, allowed the government to make money and expand the land mass of Pendleton. Any money that was made was held for 25 years. There are many famous buildings that have been created in Pendleton over the years but a famous one of significance is the Frist Church of Christ Scientist. This building began creation in 1922 and finished up in 1926. It amazingly enough is still used as a church in the present day! What is significant about, is that it is a prime example of Spanish Eclectic style architecture and is still to this day the only example of this type of architecture in a non-residential area. About Us from East Oregonian.” East Oregonian, www.eastoregonian.com/eo/about-us. “City of Pendleton.” First Church of Christ Scientist | City of Pendleton, pendleton.or.us/historical-buildings/1059/first-church-christ-scientist. “The Oregon Encyclopedia: Pendleton .” The Oregon Encyclopedia, 17 Mar. 2018, oregonencyclopedia.org/articles/pendleton/#.Wvy-uS-ZPOQ. Pendleton was founded in 1868 and has since been the hub and cultural center of Eastern Oregon. It is the county seat of Umatilla and is world-renowned for its Round-Up and Pendleton Mill and is situated on the main line of the Union Pacific System (Pendleton, Umatilla County Pioneers Association). 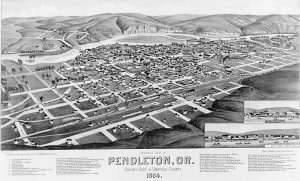 Pendleton is situated on the Oregon Trail and a gold rush in 1862 brought miners and stock raisers to the area (“Umatilla County History,” Umatilla County). The Round-Up began in 1910 and not only quadruples the town’s population, but provides a cultural fusion between the American West and Native American culture (“Pendleton,” The Oregon Encyclopedia). According to the Fire & Ambulance department of Pendleton, the town’s population is 16,904 (quadrupled during the annual Round-Up in September), the area covered by the township is 8.8 miles, and the value is just over $588,000,000 (“Area and Population Served,” Pendleton Fire & Ambulance). After established as a town, Pendleton brought in a large population of Chinese workers who had come to Eastern Oregon to work on the railroads (“Pendleton,” Oregon Encyclopedia). There was a dense system in underground Pendleton where, in the 1890s, the laborers maintained opium dens and illegal gaming parlors (“Pendleton,” The Oregon Encyclopedia). Once this railroad was built early on in early its history, it became a railhead that was an important trading post for the wool industry (“Pendleton,” The Oregon Encyclopedia). This legacy has remained with Pendleton Mills which is globally famous for its blankets and woolen gear created using Native American patterns. Although prosperous from the get-go, Pendleton suffered numerous fires in its first decades, including the IOOF Hall burning in 1872, Liberty Hall burning in 1889, the East Oregonian Building burning in 1889 with $8000 in damage, and two hotels, a saloon, and a flour mill burning in the 1890s (“Significant Incidents,” Pendleton Fire & Ambulance). The fires could have started as brushfires and swept into the town, as the climate in the high desert is very dry and hot and doesn’t reflect the stereotypical weather of the Pacific Northwest. Scanlan, John. “Pendleton.” The Oregon Encyclopedia. Portland, OR: Oregon Historical Society, 2018. The City of Pendleton. “Significant Incidents.” Fire & Ambulance. The City of Pendleton. “Area and Population Served.” Fire & Ambulance. Umatilla County Pioneers Association. “Pendleton Oregon History.” August 2014, 1-9.